Continuing our look at relics of the past, the one-room schoolhouse. I think the country schoolhouse definitely fits the category of cultural items that have come and gone in North America (but for a few pockets here and there). The Amish are probably the most obvious example of a group maintaining the small rural school tradition. I love old one-room school buildings. You still see them driving through rural areas. Sometimes they have been converted to alternate uses, like storage, or living quarters (how neat would that be, assuming the roof didn’t leak). Other times–in many cases–they are wasting away under the elements. Through their history Amish have often taken over old one-room schools. Today, most are built by the Amish. Most people have a good picture in their mind of what an Amish one-room school looks like. Still, there is a good bit of variety among the different Amish groups (the book to read if you are interested is Train Up a Child: Old Order Amish and Mennonite Schools by our friend Karen Johnson-Weiner). 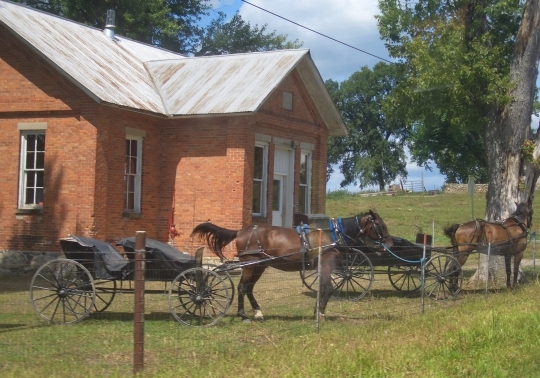 Not all Amish schools are one-room. Some are divided into two classrooms, one for grades 1-4, the second for 5-8. The Amish schools of Allen County, Indiana are huge in comparison to others. See a photo here. Some Amish students attend school under electric lights. Where? Amish in Lancaster County partner with Old Order Mennonites on education. Both Amish and Old Order Mennonite children will attend the same schools, particularly in the northern half of the county, where OOMs are found. Old Order Mennonite-built schools will have technologies that wouldn’t be seen in Amish-built schools. The other example of electric lighting would be Amish kids in public schools. Not all Amish school teachers are women, or in rare cases, even Amish. The community where this schoolhouse is found has been around since the 1960s. What do you notice about this school? We have a lot of single school houses in my area. Many have been converted to houses or museums. I went with a fellow once whose mother lived in a one room school that she converted into her house. I always thought that would be a neat house to own. Unfortunately some of these old schools are sitting, and just being let go-it’s sad. What I see around the school looks like an electric fence to me. Now that I take a real good look, it looks like there are lights inside the school. I have a friend who is Old Order Mennonite now in her 30’s and she said when she went to school they didn’t have electric. They had a wood burning furance. Outhouses and more. She and her husband put their first child to school there this year and they have electric lights, electric heating system, in door rest rooms and more. She said times have sure changed. Yes, I too, noticed the barbed wire fence — is that to protect the children, while in school, or because of it’s location, maybe, to protect them from farm animals, run-away horse, etc???? hmmm interesting — it’s like the Public schools, for the “English” — they are all fenced, with locked gates, these days — sad, but in the world today, we need to protect our children. I’ve also read that the education levels, of the Amish and Mennonites, are superb, compared to public schools…..might be that they are more disciplined in learning, rather than “who’s wearing what”, or “what the latest song is” on their iPods?! I love those windows that swing out like that on a horizontal axis. We have them at our church. And the Amish schoolhouses I’ve seen are all wooden instead of brick. the windows remind me of the windows we had in a couple of the public schools i attended; the old steel or aluminum panel windows that tilt in. Both were “older” schools. i love old school houses! thank you for the post! It is animal fencing around the school – I assume that the yar dis used for pasturing in the summer months. I hadn’t seen a brick rural school before. I have friends here in the St. John River Valley who taught or attended one room schools. The teachers would now be in their 80s, and the students at the youngest would now be mid-40s. It was a good system – children walked to the school, the school day was fairly short, everyone knew everyone, and a good basic education was provided. The shortcomings were that sometimes children were taken from school before they acquired skills in order to work on the farms, and children with learning disabilities struggled with failure. There was no automatic advancement to the high school, but in a farming community, leaving school at grade 6 or 8, as the Amish still do, didn’t seem to handicap anyone. I had never seen a brick one either! The Amish schoolhouse in Unity, ME is divided in to 2 sections, grades 1-4 and 5-8. They get a very good education in reading and math. The older boys read well in church. And the school children put on a superb program at graduation. Several of the islands in Maine also have one or 2 room schools. We live in an old schoolhouse. It was built in 1870 and was a school for 8 years. We are the third family to own it and are very proud of it! Oh wow Barb; that sounds wonderful! Has it had many refurbishments? or is it still pretty true to it’s original? Yes, it has. A second floor was added and a dormer added to a middle upstairs bedroom for more room. It’s because of that dormer we can not put the house on the National Registry. Too bad, because it’s a great place! 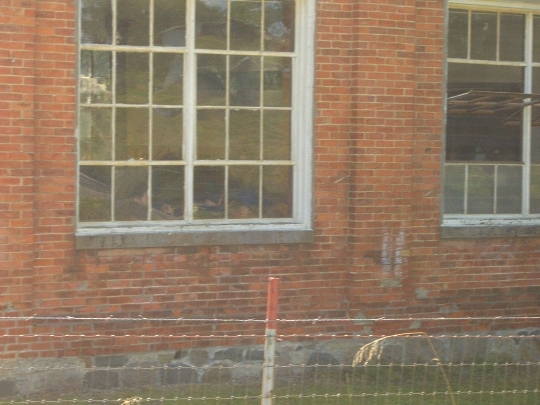 A brick Amish school with barbed wire (electrified?) fence is unusual. The windows remind me of those on old factories in Chicago, in my old neighborhood. I, too have to wonder what’s being kept out—my first thought was that it was in a “bad” neighborhood (you say the community’s been there since the 1960’s–it looks older than that, to me. I’m anxious to know where it is. Out here in McHenry County, IL, there are still existing one room schoolhouses, most used as residences, but others have been (or are in the process of being) preserved. I belong to the local Historical Society, and it meets in a one-room schoolhouse (now a funeral parlor). As I sit there in meetings,I try to imagine it the way it was as the first school in our community. I wonder what it was like being a student there? I am glad to live in an area where “old” means “treasured,”—especially as I grow older! build a new small building on the site for community use. schools. Brings back lots of memories. You don’t want an animal to get both caught by a barb wire, which happens from time to time, and being shocked and unable to get away.